Inverse Kinematic (IK) for an arm (or leg) consisting of upper arm, middle arm, lower arm, and hand. 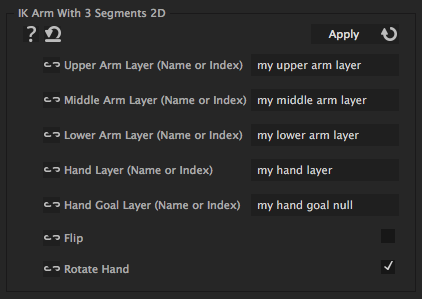 You can use this, for example, to animate a finger (which in contrast to an arm consists of three segments). For a "normal" arm without middle arm segment see the "IK Arm With 2 Segments 2D" iExpression. When the arm is set up like this, all you need to do is to enter the names of the respective layers into the iExpression and apply it to the rotation of upper arm, middle arm, lower arm, and hand. is the name or index of the layer containing the middle arm.